Staatsburg, N.Y. - Staatsburgh State Historic Site, also known as Mills Mansion, will hold a dance workshop on Sunday, April 29 at 1p.m. “Scandalous Dances of the Gilded Age” will teach the waltz and the tango in a spectacular setting, a turn-of-the-century mansion overlooking the Hudson River. The cost is $15; beginners are welcome and need not bring a partner. The workshop will be led by Joe Donato of the Hudson Valley Dance Depot in Lagrangeville. Reservations are required and can be made by calling Staatsburgh at (845) 889-8851 x 336. Staatsburgh was the autumn home of industrialist and philanthropist Ogden Mills and his wife, Ruth Livingston Mills, a prominent figure in New York Society. The mansion was redesigned by the famous architect Stanford White in 1895 and decorated in the styles of 17th and 18th century France. In this lavish setting, Ruth Livingston Mills hosted parties for the elite of Gilded Age Society. Dancing was often the centerpiece of Gilded Age parties. Hostesses like Ruth Mills showed off their wealth with elaborate balls in elegant ballrooms. Although the Millses had a fabulous ballroom in their New York City mansion, Staatsburgh was a more informal country house setting, where smaller dances were held in the grand reception hall. 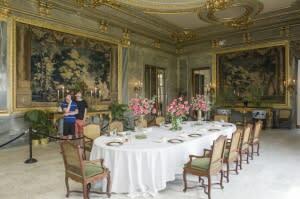 As Staatsburgh has no ballroom, the dance workshop will be held in the opulent dining room. With its European marble and gilded décor, the dining room was designed to rival the splendor of French palaces. In the early 20th century, the sultry and sensuous tango made its way from Argentina to Paris. Guardians of morality warned against its malign influence as the tango craze spread to Berlin, London and New York. But after movie star Rudolf Valentino tangoed on screen, the dance’s popularity knew no bounds. Workshop participants are invited to follow in the footsteps of the famous families of the Gilded Age, dancing where the Astors and Vanderbilts once cut the rug with Ruth and Ogden Mills. Staatsburgh State Historic Site and the Ogden Mills & Ruth Livingston Mills Memorial State Park are located on Old Post Road in Staatsburg, off Route 9 between Rhinebeck and Hyde Park. The historic site is one of 6 sites and 15 parks administered by the Taconic Region of New York State Office of Parks, Recreation and Historic Preservation. For more information, call 845-889-8851, or visit Staatsburgh’s websites at www.parks.ny.gov/historic-sites/25/details.aspx, www.facebook.com/StaatsburghSHS and www.staatsburghstatehistoricsite.blogspot.com. The New York State Office of Parks, Recreation and Historic Preservation oversees 180 state parks and 35 historic sites, which are visited by 62 million people annually. A recent study found that New York State Parks generates $1.9 billion in economic activity annually and supports 20,000 jobs. For more information on any of these recreation areas, call 518-474-0456 or visit www.parks.ny.gov, connect on Facebook, or follow on Twitter.